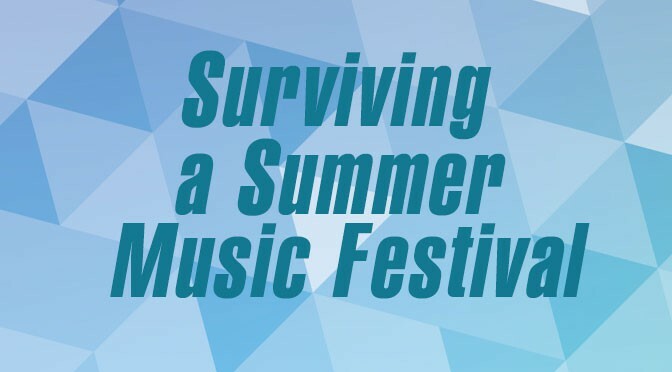 Home News	Surviving A Summer Music Festival! With Summer finally here it can mean only one thing, that festival season is coming! With the UK playing host to some of the biggest and most iconic music festivals in the world why not grab a bunch of friends and of course your wellies and get in on the action. It’s the perfect chance to have fun and watch some of the best bands around. We’ve all seen the news where countless festivals are hit with a month’s worth of rain and no sun, however fear not, and with a bit of festival style know how you will be ready for whatever the weather throws at you. Here in the UK we are really lucky to have some of the most iconic and largest music festivals in the world including Glastonbury, Leeds and Reading and of course the Isle of Wight festival. With so many new bands and new music coming out of the UK in the 60’s and 70’s holding a festival was the perfect chance to see a large number of bands all in one place. These started off as small, free festivals however this soon kicked off the niche and bigger festivals came along that are still proving to be as popular today! Leeds and Reading is the oldest festival starting out back in 1961 followed by the Isle of Wight and then Glastonbury in 1968 and 1970 respectively. Over the years the numbers of people attending these music festivals has risen drastically and so unfortunately this sees the cost rise, yet with so much to do including camping, fair grounds rides vintage stalls and games alongside the actual music itself you can really make a weekend of it. Glastonbury is the biggest festival in the world, with its huge crowd capacity and massive Pyramid stage it is truly iconic, everybody wants to go and every band wants to play it but that wasn’t always the case. Nowadays the festival sees up to 200,000 music fans descend for the weekend that will pay out over £200+ for the weekend while back in 1970; the year it started, just 1,500 people attended paying a £1 entrance fee which came with a bottle of fresh milk from the farm! Back in 1970 the Isle of Wight festival saw a record 600,000 people descend on the island after a very impressive line-up was revealed which pushed up the population by a huge 40%, those lucky enough to get in paid just £1.25 for their ticket compared to nowadays when people can pay up to £250+. With more and more music festivals being created each year for all different genres of music you’ll be spoilt for choice when it comes to choosing one to take part in. Over the years there have been some truly amazing festival moments that are still talked about to this day! So many brilliant bands have played and we have picked out some of the most memorable moments. Do you remember any of these yourself? Reading 1992– Nirvana– this was the bands last ever UK performance and is thought of to be one of their most awe inspiring. In a comeback at the press after they had commented on the bands bad habits Kurt Cobain was wheeled on stage in a wheelchair by a UK journalist. Dressed in a surgical gown and wig, Kurt tried to fool the crowd into thinking he wouldn’t be able to perform before they put on one of the most memorable Reading performances of all time that is still talked about to this day. Glastonbury 2000– David Bowie-all the way back in 1970 Bowie had played the first ever Glastonbury festival, he had just hit the big time and was about to become his famous alter-ego Ziggy Stardust. It was only fitting that he came back on the festivals 30th anniversary to play again as one of the headliners with a huge back catalogue to choose from. It was an iconic performance and a fantastic way to bow out as he cut back on his live performances shortly after this. Reading 2003– Blur– after a short break from performing Britpop favourites Blur came back with an amazing Reading performance singing old favourites and showcasing new material, however when singer Damon Albarn fell off of the stage into the camera pit during the energetic performance it became more well known for that than the actual performance itself! Glastonbury 2014– Kasabian– the Leicester band were surprise headliners for the festival back in this year and after much talk of whether they were a big enough band to be able to close the iconic festival, they triumphed in a headline slot to remember. With the crowd going wild, flares being lit, mass singalongs and the band thundering through their hits it was not for the fainthearted. Glastonbury 2008– Jay Z– the festival has always had a very diverse selection of music however to the dismay of many people Glastonbury went hip-hop in this year by asking Jay Z to headline the biggest night normally reserved for a rock band, he however smashed it and gained much praise for his different and energetic performance which later led to his wife Beyoncé headlining the festival herself a couple of years later. Leeds 2010– Arcade Fire– with such a hard rock crowd to play to at Leeds, the ten piece Arcade Fire could have failed miserably with their sing-along anthems and mix of classical instruments with a rocky edge however it was one moment that brought the crowd together in a mass sing along, as the sun set and they played all their hits. It was the moment they cemented their credentials as a fantastic live band. Glastonbury 1995– Pulp– the new band on the block were thrown into the deep end when the Stone Roses pulled out of headlining at the very last minute and Pulp found they had been bumped up the bill to headliners. However with a now classic album to play, a very entertaining frontman and Britpop taking over they triumphed and as people went back to their tents they were still singing the iconic song, Common People. Glastonbury 2013– The Rolling Stones– this iconic band had surprisingly never played Glastonbury before they headlined in spectacular fashion that saw the old and young come together to sing all their classic hits. Having been around since the 1960’s the Stones are used to putting on a show and having never played the festival before it was going to be special. With an absolutely massive back catalogue to choose from that spanned 50 years this was one set that no one wanted to miss. Organiser Michael Eavis called it the greatest Glastonbury moment in its 43 years! Music festivals are one of the only times you can really play with your look, be creative and really rock a bold, eye-catching style. 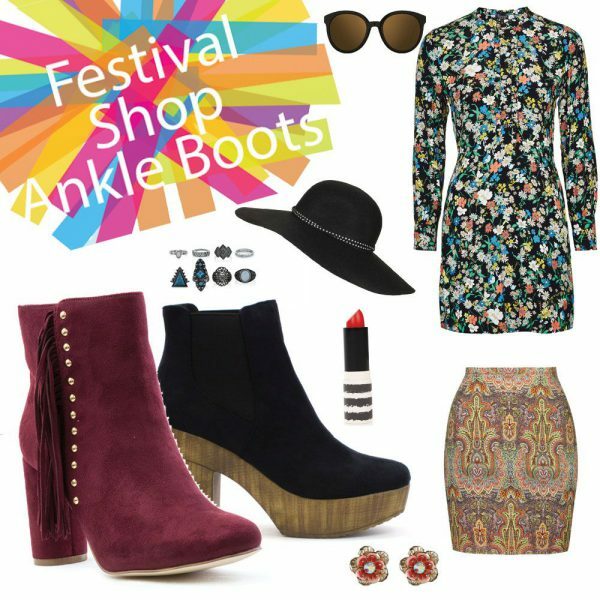 Knowing what footwear to pack for a music festival can be a bit stressful as we can’t really rely upon the weather forecasts however there are a few key pieces that will work with all your festival looks so make sure you pop them in your bag. The most important and essential footwear to pack into your festival luggage is a pair of wellies. 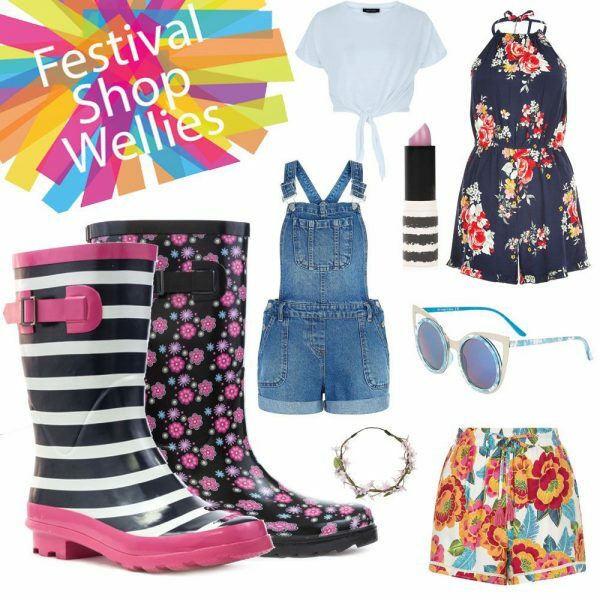 Wellies will fast become your best friend throughout the festival weekend. They are super comfy, which is perfect when you’re on your feet all day and durable enough to tackle any rowdy crowd. Festivals are well renowned for being wet and muddy so a pair of wellies will really help when it comes to keeping your feet warm and dry if the heavens open. Another pair of shoes that are a must have for your festival bag are a pair of canvas shoes. Canvas shoes are perfect for when you’re on your feet all day and will give your casual outfit that final finishing touch. By choosing bold colours, pretty pastels and eye-catching patterns you’re bound to stand apart from the fashion crowd. If the weather is a little cool these are much better than a pair of sandals. For your own unique look swap the laces for bolder colours or ribbons and add studs and diamantes to them for an edgy touch. If you’re looking for a cool, grungy look that harks back to the 90’s then adding a pair of lace up ankle boots to your outfit will help you achieve this. Choose a cut out style and add pretty frilly socks for a cool contrast, if you’re feeling brave go for a chunky heel; the extra height will work perfectly when in the crowds of people and they are surprisingly comfy on your feet. Choosing styles with chunky buckles and studs will give an otherwise plain outfit a cool twist that works perfectly for any festival. With so many different festivals to choose from why not go for a relaxed festival, where you can sit with friends and enjoy the Summer sunshine. Embrace your inner hippy chic by putting together a boho look that never goes out of fashion. Choose beautifully beaded sandals and styles with sparkly diamantes to achieve that bohemian feel. Why not add a retro feel to your overall outfit? Styling short dungarees with pastel jelly sandals is one nineties look you’ll want to recreate while block heeled sandals give you a look that will take you back to the stylish seventies, pair with a playsuit or crochet shorts for an authentic seventies look. Don’t forget to take a small bag to carry all your essentials around in when you’re away from your tent. A small fringed backpack is big enough to carry all you need for the day while giving you a gorgeous festival ready look that is bang on trend. For all you guys out there, footwear is probably last on your mind when you’re packing your festival bag however if the rain hits or the sun shines you are going to want to be prepared. A pair of canvas shoes is the perfect transition shoe; we know the Great British weather can sometimes be a bit cold or grey so this is one style that is essential for those days. Choose a style with interesting colours and textures to finish off your cool festival look or add a bold coloured lace as an eye-catching touch. They will work well with any outfit including skinny jeans and shorts. Wellies! You will need to pack a pair of wellies, with the Great British Summer bringing more rain than sun sometimes a good pair of classic green wellies will see you right. They are perfect for keeping feet warm and dry and are great for protected feet when you’re in the moshpit. Tuck your jeans into them and add a hoody for a relaxed look that will work all weekend. If you’re lucky and the sun does make an appearance a pair of sporty sandals or flip flops will really help to keep your feet cool and comfy, they are probably best to wear for a more relaxed festival where you won’t get your feet trampled by the crowd. Style them with jeans or shorts when the temperature heats up! Festival Must Haves: What to Bring! So you’ve got your outfits and footwear sorted but there are still some vital must haves that you should always pack in your festival bag! Tickets– yes it’s an obvious one but you will be surprised at how many people actually forget their festival tickets. If you forget them you will not be able to gain entry to the festival so it really is worth checking, double checking and even triple checking. Keep them safe with your ID, money and bank card in a secure bag or wallet. If you’re concerned about carrying them around, use a small under clothes wallet, you can find these online. Portable Urinal– this will be a godsend at night-time, trying to find your way to the loo in the dark is not fun so this will come in handy. Good for the environment, they can be found online. Raincoat/Waterproofs/Jumper– we can’t stress enough how essential these are. You never know what is going to happen with the weather and standing around getting absolutely soaked and cold will make you feel absolutely miserable and ready to go home. A jumper is essential for night-time, it can get very cold very quickly and this will keep you cosy under your sleeping bag. Sunglasses/Hat– when the hot weather does arrive make sure you have sunglasses and a hat to keep the glare at bay. It will save you getting sunstroke and keep any headaches from the sun away. Water/Water Bottle– it is important to stay hydrated throughout the day! All festivals have water fountains so you can keep topping up your bottle as and when you need to, there is a lot of standing around waiting for bands, getting up early and going to bed late so your need for water will increase. It’s important to keep your energy levels up so plenty of water will really help. Phone/Phone Charger– many festivals have charging facilities however it can be packed with people so make sure your phone is fully charged before you leave and turn your phone off as much as you can to save your battery. Always keep your phone with you however in case you and your friends get separated. Lookout for solar powered chargers online as these can come in handy. Toiletries– the showers are pretty grim at festivals as anyone who’s ever been will tell you so make sure you have a few essentials to help. Festivals such as Glastonbury just don’t have many shower facilities so do it the “Glastonbury way” and use wet wipes to keep clean, they are fantastic for removing mud and grime as well as cooling you down on a hot day. Dry shampoo will revive unwashed hair giving it volume and making it smell great, while a small travel sized toothpaste and deodorant will be enough to see you through the weekend. First Aid Kit– a small first aid kit is a must. Keep a supply of plasters for sore feet, paracetamol for sore heads, bandages, sterile wipes, hand sanitizer and sun cream in there to keep everyone happy and healthy! If you’re going with a group of friends all pick one item to bring to make up your kit. Flag– with thousands of people attending a festival your tent can soon get lost in the sea of others, make sure yours stands out by added a flag to the top or in the ground next to it’s easy to find after a long day. Why not pick up some cheap solar powered lights that you can hang around the flag, after a day of sunshine they will light up making it easy to find your way back. Another good thing to have is a torch, after the last band has played it can be hard to navigate your way back to your tent in the dark but a torch will help light the way. One last thing, mark all valuables with a sticker that includes your house name and postcode so if you do lose any of your possessions they can be easily be returned to you. To keep within the rules of the festival and to save yourself carrying a lot of luggage there are a few things that you are not allowed to bring into a festival, so take note and don’t get caught out this Summer, always read the festivals info guide online for more on what you can and can’t take in. Too Much Stuff– you can’t take everything to a festival, as tempting as it is to take a lot to make your stay as comfortable as possible it’s important to pack the essentials only. There is usually a long walk from the bus/train station to your campsite so you don’t want to be lugging around masses of bags. Festivals such as Glastonbury have a “Leave No Trace” campaign, where they insist you only take things you can take back home. Glass Bottles– many festivals are happy for you to bring in your own food and drink however they can be quite strict when it comes to glass bottles, even perfume bottles will be confiscated if found so make sure you take all liquids in plastic bottles only. Gazebos– many people take a gazebo to a festival and they usually get left behind. Again leave it at home, you don’t really need it and it just takes up more space in and around the camp area which makes it harder for other campers to find space for their tent. No Animals– it’s quite obvious that no animals are permitted at a festival, unless of course it is a registered guide or hearing dog. Sound Systems/Kites/Flares/Fireworks/Lanterns– these are all items which are not permitted at many of the big festivals. Anyone who does get found letting off fireworks and flares faces being evicted from the festival site as it is dangerous to other festival goers. Sound systems create too much noise at night when other people are trying to sleep; you’re at a music festival, so leave it at home and enjoy the music there. There is no need to take these items into the festival so leave them at home. So there you have it, our bumper guide to festivals! Always remember to keep your luggage to a minimum, make sure you have the essentials and most importantly have a fantastic time, it’s such a good excuse to catch up with friends and see some truly amazing bands. If you have any issues or queries always check out the festivals webpage, they are normally packed full of useful information. For me it depends on whether the weather is permitting. Sometimes all you need is a bottle of water.